These bonuses are available until October 31st. To claim a bonus simply enter the appropriate coupon code as you deposit. The first bonus must be claimed before claiming the second bonus, and so on. 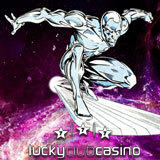 Metro-style Lucky Club Casino offers a wide selection of feature-rich game from Nuworks. Available at only a few select online casinos, these include favorite slots like Monster Millions and Agent Cash as well as traditional table games like Roulette and Blackjack. Candyland Cash is a 25 payline slot game with pies, cakes and cookies spinning on its colourful reels. Gingerbread Men symbols award up to 50 free spins with up to 5x multiplier and this game also has Nuworks’ Win-Win feature that makes sure players win during bonus rounds. Released this spring, just in time for World Cup 2014, Winning Shot is a soccer-themed slot game that also has lots of chances for free spins. Three or more of the Soccer Ball scatter symbol triggers the Goal Kicking Feature where players take penalty shots to win free games and bet multipliers.